The fifth Duke of Portland inherited the Dukedom on the death of his father in 1854. The Duke was a very private man, and, in his later years, sought no social contact with local people. 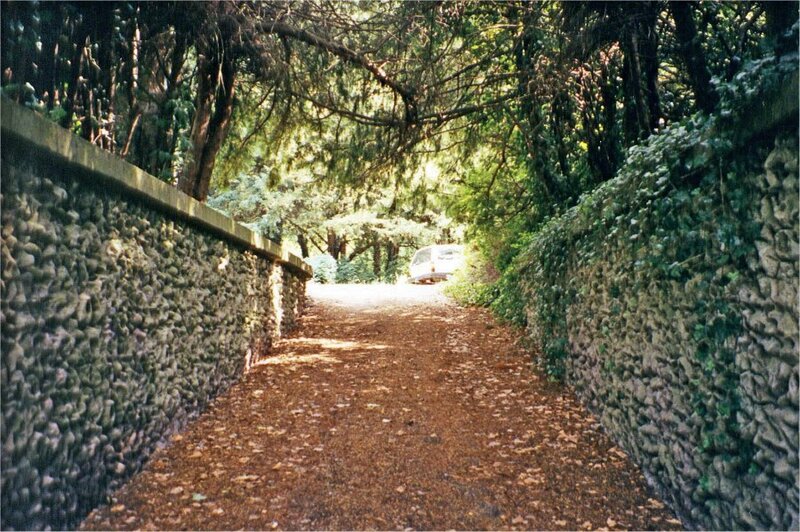 He often travelled away by train on the newly introduced railways, but, rather than be seen riding through his ‘village,’ he built a carriage drive that ran through a series of cuttings and tunnels between the station and the Abbey. He kept a special flat wagon in a siding at the station, onto which his coach could be loaded before being shunted for connection to a London-bound train. The Duke remained inside, with blinds drawn for the entire journey. Despite being noted as an eccentric and a recluse, however, he greatly enjoyed the management of his estate, and had a great passion for building. His several projects – ranging in time between c1860 and his death in 1879 [ii] – included housing for his many workers, and a School House for the education of their children – pictured in Fig 1. He was always extremely careful about money, and everything was paid for out of the income received from his many property interests outside Welbeck. 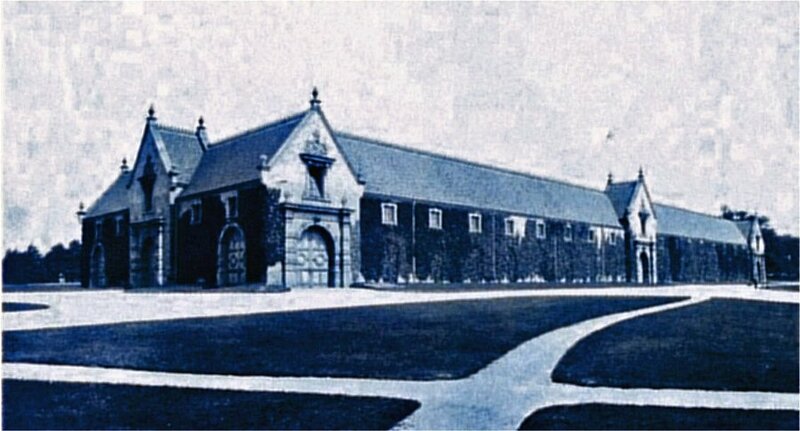 Another major project was a new Riding House. At nearly 400ft long, 108ft wide, and 50ft high, it is the second largest in the world, and the design of its roof is of particular interest. As can be seen from the external view in Fig 3, it looks to have a conventional pitched tile roof, but, behind these tiles, is a massive domed roof of glass and iron, as can be seen from the internal view in Fig 4. This dome is completely invisible from the outside. And then there were the Hunting Stables; a Coach House, and even a Poultry House – pictured in Fig 5 – in which his chickens lived in truly grand style. They roamed the grass yard – enclosed by high iron railings, and planted with fruit trees – during the day, and roosted at night in the long stone building that they entered through small doorways at ground level. There is even a (quite Pulhamesque) fountain in the centre of the yard, and an ornamental stone fowl stand on tall piers at the corners. 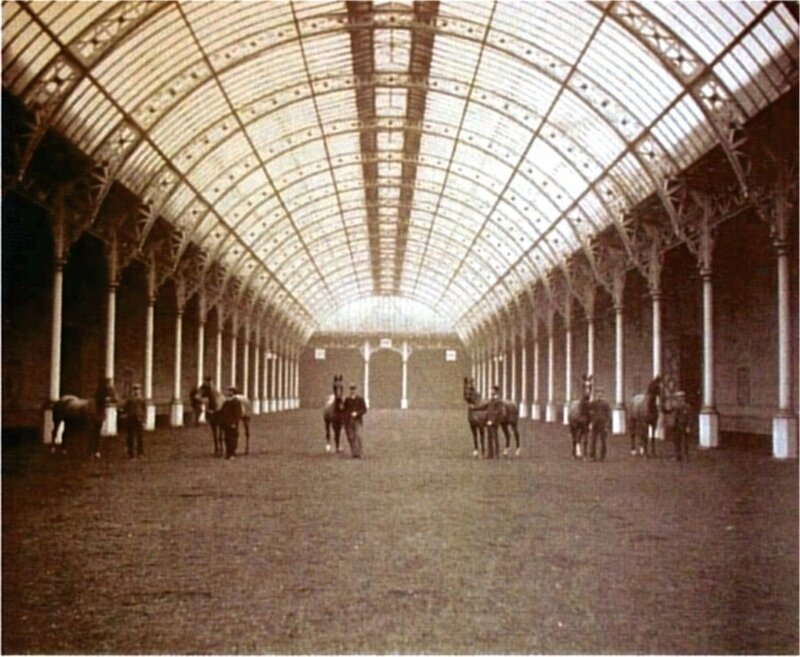 This is obviously just a small part of the story, however, because the Duke even built an underground church with a floor area of a ¼-acre that was later converted into a picture gallery, and was also used as an underground ballroom. [iv] It is surrounded by a range of underground reception rooms – all linked to the two-and-a-half miles of underground drives that lace the Park – and its floor area is covered by a roof span of 63ft, which is fitted with large rectangular skylights at ground level, as can be seen in Fig 7. This – like Figs 3, 4 and 5 – is an old picture, and I did not have the opportunity to check how things have changed since it was taken, but, as far as can be seen from this picture, the ornate plasterwork on the ceiling is very reminiscent of other work that I have seen during the course of my travels, and I can’t help wondering whether this might be another example of Pulham’s craftsmanship. I saw no sign of the dropping well or drinking fountain during my visit in 2002, but I noticed several features around the estate that looked tantalisingly ‘Pulhamesque’ in style. 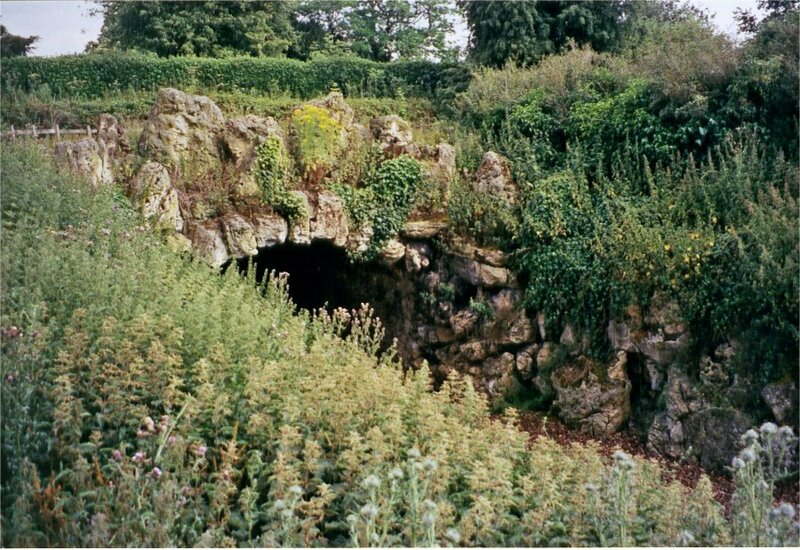 As noted in Rock Landscapes: The Pulham Legacy, a number of sites listed in James 2’s booklet contain evidence of their further involvement in other projects, so it is quite feasible that he could have been involved in other projects at Welbeck, in addition to lining the inside of a tunnel with Pulhamite. 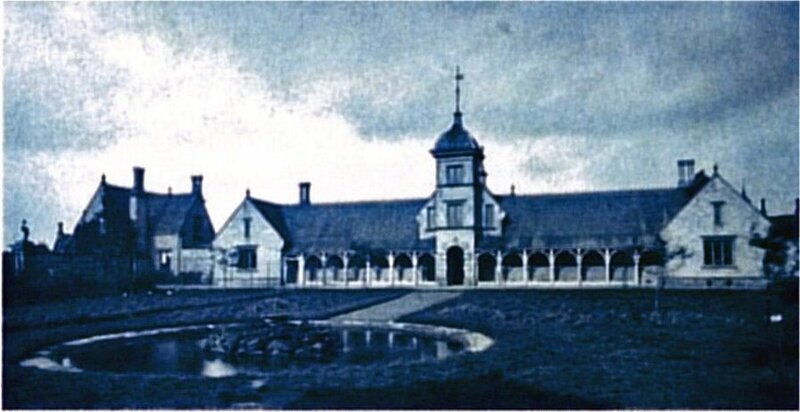 The buildings all share a common style that is similar to the School House shown in Fig 1. 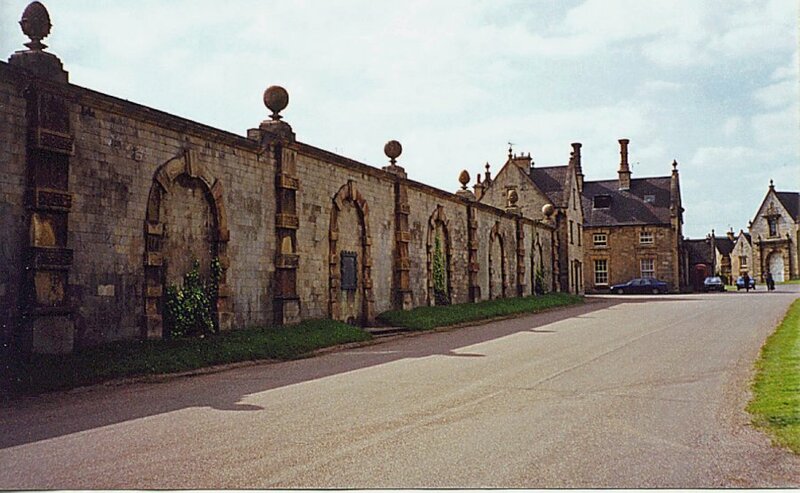 Many – like the Walled Garden and the Riding House in Figs 2 and 3, for instance – contain key-stoned arches as featured panel centres, and carry terminal ornamentation that could have come straight out of the Broxbourne manufactory, so I do wonder if they might all be Pulham buildings. And then there is the question of the terminals themselves. 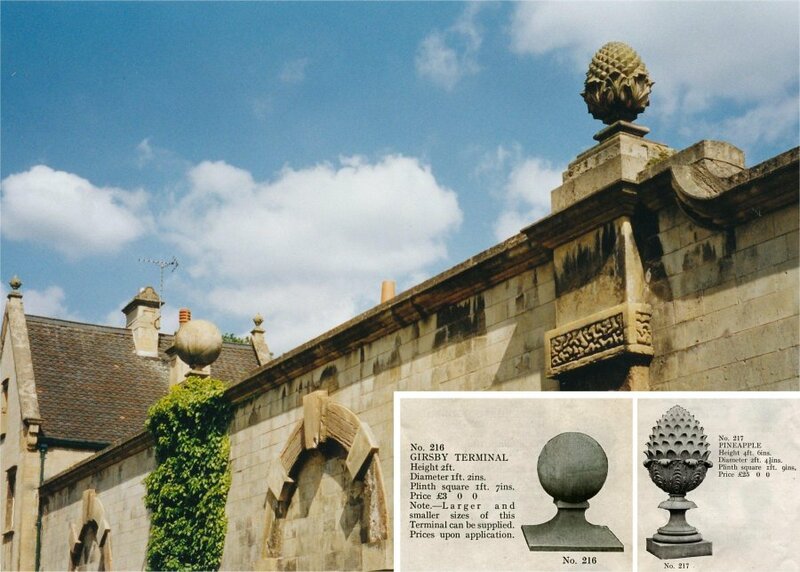 There are ‘ball’ and ‘pineapple’ wall terminals on a lot of the buildings around the estate, of which the picture in Fig 8 is one. These terminals were thought to have been made by Coade, because they are definitely ‘Coade-style’, and differ slightly in detail from those illustrated in the Pulham Catalogue, [v] but one has to remember that the Coade factory no longer existed in the 1860s, when these buildings were erected, so the conclusion must be that they are likely to be Pulham items. 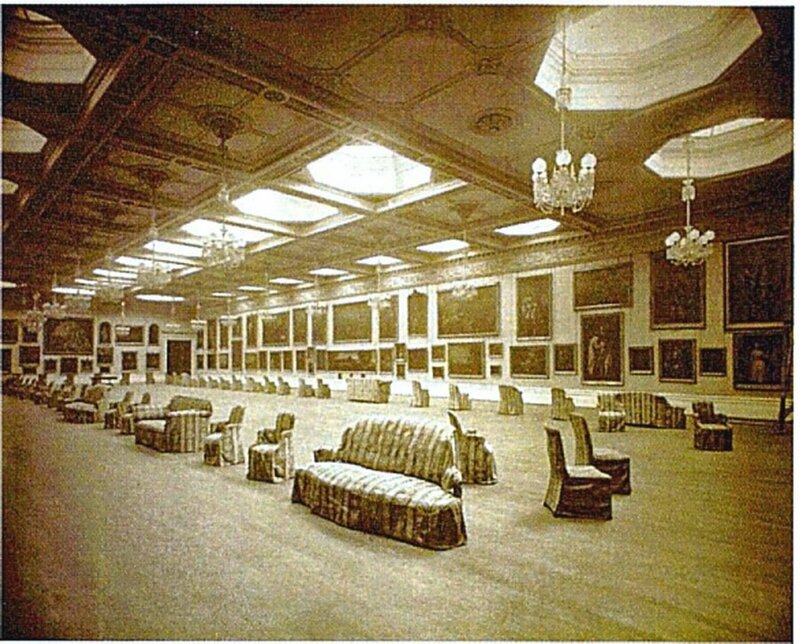 This is not to say that James 2 did all the construction work at Welbeck by any means – indeed, most of the actual building work was carried out by local contractors and workers, of whom there were up to 1,500 engaged during the busiest periods. [vi] Their general style is one with which James 2 would almost certainly have been sympathetic, however, and the general idea of Pulhamite-lined tunnels and underground rooms would have really fired his imagination, although I imagine that, if the Pulham craftsmen had been on site, they are likely to have been involved mainly with the more ornamental and decorative aspects of the work, rather than with the buildings themselves. Another feature of these grounds is a Sunken Pool Garden. This is private, and I was not allowed access to it during my visit. I was able to poke my camera through the locked gate and take the picture in Fig 9, however, and had an immediate feeling of déjà vu, because, looking at the pergola surrounding the circular central pool, I was reminded immediately of several others that I have seen on other Pulham sites. 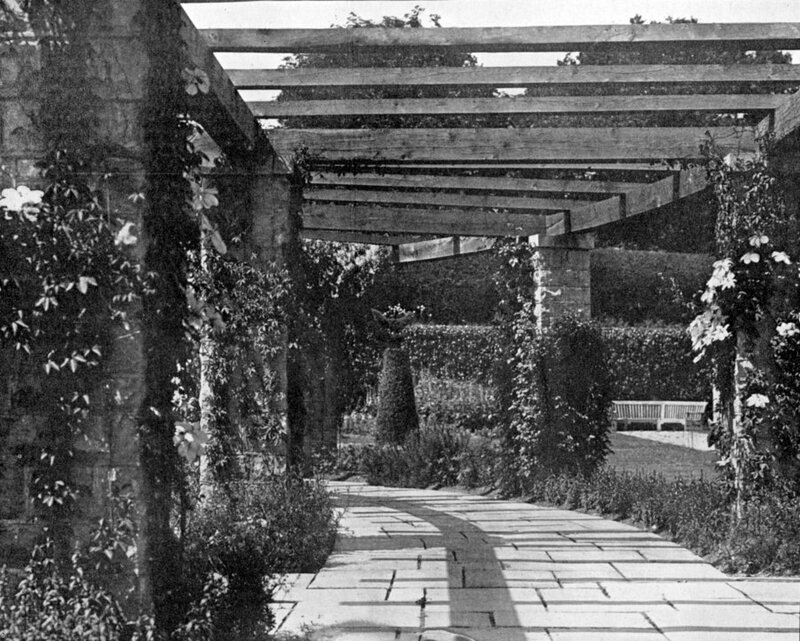 I would have dated these features as somewhat later that 1879, but the firm could easily have returned to construct these at a later date – in fact, Fig 10 is a photograph of the pergola published in 1915, which indicates that it could have been erected somewhere around 1910. And, finally, take a look at the photograph in Fig 11. This is of the boundary wall to the path that leads to the Pool Garden, and looks as if it is faced with a moulded abstract pattern. Now where have we seen walls like that before? . 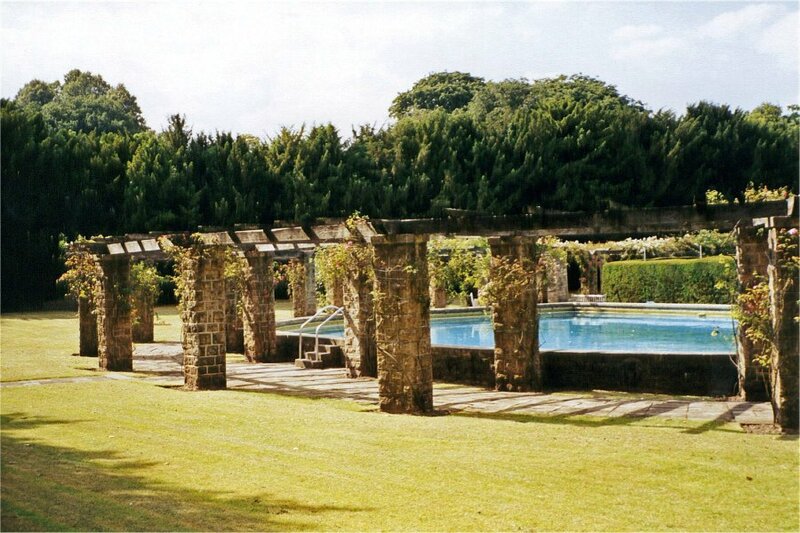 . .
Posted on June 4, 2016 June 7, 2016 by Claude HitchingPosted in Sites Month 2Tagged . . James Pulham and Son, Coade, Duke of Portland, pergola, Riding House, Subterranean Passage, swimming pool, Terminals, tunnel, walled garden, welbeck abbey.